Customer support for Google's Nexus One has some users frustrated. (Wired) -- Google's Nexus One phone may have been one of the most anticipated devices of the last few weeks. But since the smartphone's launch last Tuesday, it has left a string of unhappy customers in its wake. Nexus One has been plagued by consumer complaints including spotty 3G connectivity, a high early termination fee, poor customer support from Google and problems with the touchscreen. "There are some aspects of the experience that Google didn't think through as carefully as they should have," says Charles Golvin, an analyst with Forrester Research. "This has implications for the store they have launched and their future ambitions for it. Google, clearly, has a lot of work ahead of it." Google introduced the Nexus One as the first device to be sold by the search company itself, rather than a manufacturing or carrier partner. The Nexus One, which runs Android 2.1, has been designed by HTC and works with T-Mobile's network in the United States. But contrary to initial speculation, the device isn't free. It will retail for $180 with a 2-year contract with T-Mobile. An unlocked version is also available for $530 -- a price similar to most other smartphones -- and that version will work on other GSM phone networks worldwide as well as AT&T in the United States, although with some limitations. The difference, though, is the Nexus One is available only through Google's online store. Unlike with a Motorola Cliq or a HTC G1, users can't walk into a T-Mobile store and buy the Nexus One. They can't even count on T-Mobile's customer service representatives in store or the company's phone support to solve their problems. It's a strategy that has backfired on Google. 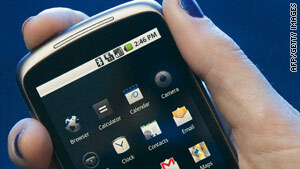 The company's support forums are full of customer complaints around the Nexus and the company's poor service. "A lot of complaints and frustration that people are expressing would normally be handled by going back into the store or by calling the support help line," says Golvin. "Having a physical location where you can take your phone back helps customers and Google seems to have underestimated that." "Solving customer support issues is extremely important to us, because we want people to have a positive Nexus One experience," says a Google spokesperson. "We are trying to be as open and transparent as possible through our online customer help forums." Many of the customer complaints are centered about the device's inability to connect to T-Mobile's 3G network. The Nexus One does not pick up the 3G network or keeps switching to the slower EDGE network, say some users. A Google spokesperson says the company is aware of the problem. "We are aware of the issues that have affected a small number of users and are working quickly to fix any problems," the spokesperson told Wired.com in an email. "We hope to have more information soon. When we do, we will post it to the user forum." Add to all this Google's decision to charge a separate early termination fee in addition to the one charged by T-Mobile. Nexus One customers who bought the subsidized, $180 version and then decide to cancel their contracts will have to pay $200 to T-Mobile. But Google also charges users a $350 "equipment recovery fee" if you give up on the contract within 120 days. Including all charges, Nexus One customers who want to bail early will end up paying $550. That's significantly higher than the controversial $350 early termination fee imposed by Verizon last year. "Google provides a subsidy for devices purchased with T-Mobile USA service. If a consumer cancels service after 14 days, Google recoups this subsidy in the form of an equipment recovery fee," says the Google spokesperson. "After 120 days, the equipment recovery fee will no longer apply. This is standard practice for third party resellers of T-Mobile and other operators, and you will find similar policies for other mobile service resellers. The T-Mobile early termination fee is separate and handled by T-Mobile." Despite the problems, Google can bounce back, says Golvin. Customer dissatisfaction is likely to be just a small speed bump in the road for Google's mobile ambitions, he says. "Google tends to have a bit of a Teflon coating," says Golvin. "People tend to cut them a lot more slack -- as they do with Apple -- than they do with their mobile operator." Subscribe to WIRED magazine for less than $1 an issue and get a FREE GIFT! Click here!